It’s not often that oncologists get to be the first to utilize cutting-edge technology. “Traditionally, technology and devices are within the domain of neurosurgeons and radiation oncologists,” said Eric T. Wong, M.D. 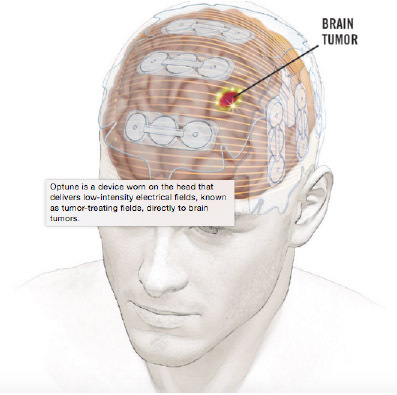 But Optune, a device that delivers low-intensity electrical impulses or “tumor-treating fields” (TTFields) to the brain, provides oncologists, specifically those who treat glioblastoma multiforme (GBM), with an opportunity to apply technology as part of their standard treatment regimen. “This device has proven, superior efficacy when compared to chemotherapy. It does not have serious adverse events like chemotherapy, and the patient’s quality of life is good,” said Wong, associate professor of neurology at Harvard Medical School and co-director of the Brain Tumor Center at Beth Israel Deaconess Medical Center. Wong spoke at the Chemotherapy Foundation Symposium™ on the topic of TTFields and how the technology can be applied within GBM and beyond. Optune, a noninvasive apparatus, was first approved in 2011 as monotherapy for adult patients with GBM that recurred or progressed after chemotherapy. That approval was based on a prospective, randomized, open label, active parallel control trial that compared the effectiveness and safety outcomes of recurrent GBM in subjects treated with Optune with those treated with an effective best-standard-of-care chemotherapy. Wong was one of three physicians to present the data to the FDA. In the study, the median survival was 6.6 months in the Optune arm versus six months with standard and the progression-free survival (PFS) at six months was 21.4 percent with Optune compared with 15.1 percent in the control arm. Responses were more common in the Optune arm, with 14 percent of patients responding versus 9.6 percent in the control arm. In October 2015, the FDA approved Optune in combination with adjuvant temozolomide as a treatment for patients with newly diagnosed GBM following surgery, chemotherapy, and radiation therapy, based on an improvement in survival seen in the phase 3 EF-14 trial. “In this phase 3 study in which patients received adjuvant temozolomide plus TTField or adjuvant temozolomide alone, TTField was clearly superior in terms of patients having a longer overall survival (OS) and also a longer PFS,” said Wong. The trial included 695 patients who were randomized in a 2-1 ratio to receive adjuvant therapy with Optune plus temozolomide or temozolomide alone. After a minimum follow-up of 18 months, the risk of progression or death was reduced by 37 percent with the addition of Optune to temozolomide. The median PFS was 7.1 months with the combination compared with four months with temozolomide alone. The median OS was 19.4 months with Optune compared with 16.6 months with temozolomide alone. In both trials, Optune proved to be well tolerated, said Wong. Toxicities are primarily dermatological, and include scalp irritation and scalp burn. In more extreme cases, ulcerations or skin breakdown can occur, he said. Minor skin toxicities are typically treated with a topical high-potency corticosteroid cream, while more severe toxicities may require temporary suspension of treatment. Optune works by attaching directly to the patient’s head to deliver electromagnetic field therapy using low-intensity electrical impulses to the brain. The device is portable and battery-operated. The FDA approved a smaller and lighter version of Optune in July 2016. This technique is thought to slow or reverse tumor growth by inhibiting mitosis during metaphase, anaphase, and telophase, explained Wong. There are additional trials looking at Optune within the neuro-oncology space, said Wong. The treatment is being investigated in combination with Avastin (bevacizumab) in recurrent GBM and as with stereotactic radiosurgery. A phase 3 randomized trial that is currently accruing patients will look at the efficacy of TTFields in non–small cell lung (NSCLC) cancer brain metastasis, said Wong. In addition, the treatment is being investigated outside of the brain cancer space. There are trials in pancreatic, ovarian, mesothelioma, and NSCLC looking at the Optune in combination with several different treatments.